The goals of the first mission to test our ability to launch a balloon, track it as it ascends to over 100,000ft and then back to ground level, and then recover the payload. 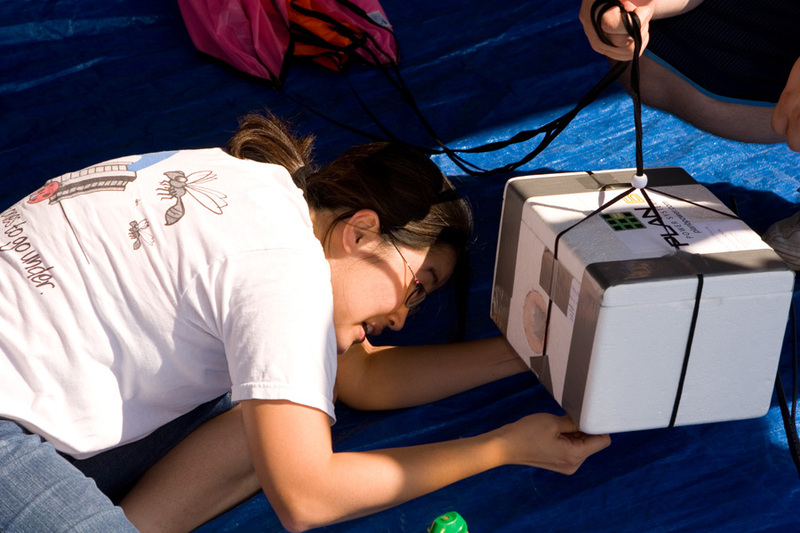 This flight will be used as an education in high altitude balloon experimentation. Future missions will be designed for maximum altitude and will have higher resolution imaging subsystems. 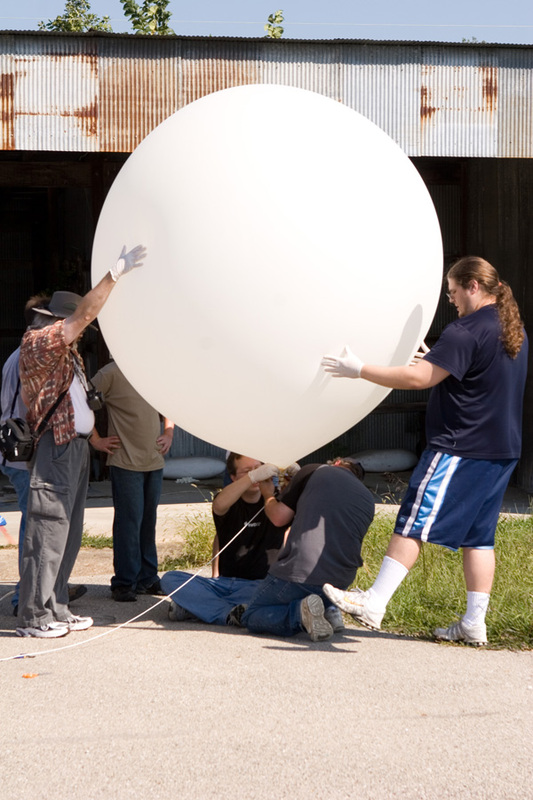 Launch date is for Flight #1 of the General Protection Fault is scheduled for 9/23/2007 at 10am CDT, weather permitting. We'll be launching from the Rolla Downtown Airport – click for Google Map. Note that this is NOT the airport in Vichy. This is very close to Rolla on Martin Springs Drive. You’re welcome to come out and watch, but if you do, please try to help us out by parking in the airport parking lot (gravel) and not on the Tarmac (pavement). 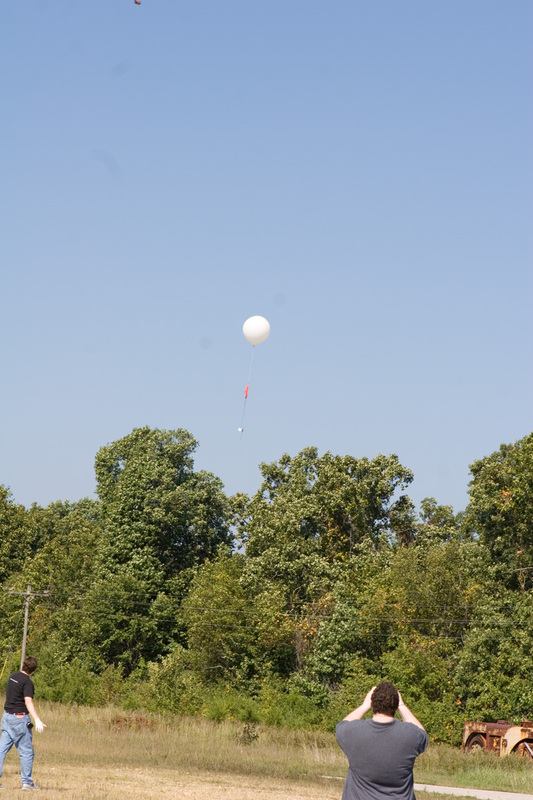 The current flight model shows the balloon flight landing about 25 miles Northwest of Rolla about 208 minutes after we launch. Mark and Nathan Bookout, Ryan Lantzer, Eric Sigler and Jennifer Song, Nathan Neulinger, Bryan Thompson have all been involved in the design and construction of the balloon. On launch day, Charles Huber, Dan Uetrecht, Rob Phelan, John Luther and "Todd From The Helpdesk" came out to watch and ended up being put to work filling the balloon. Note that this is not a UMR-sponsored experiment. A bunch of us who work or have worked at UMR also decided to attempt this. You know, lots of people ask why we're doing it. And I gotta say - I really don’t know. It's been a huge amount of work, but it sure has been fun. Personally, I’m doing it for the adventure of it all. If I get a picture from 100,000ft as a souvenir, so much the better. The amateur call sign we’re using belongs to Mark Bookout. It is KC0VNQ. To generate a KML file that can be viewed in Google Earth, see here. You can also enter this network location in GoogleEarth directly. Any data you see before the launch date is just test data and should be ignored. 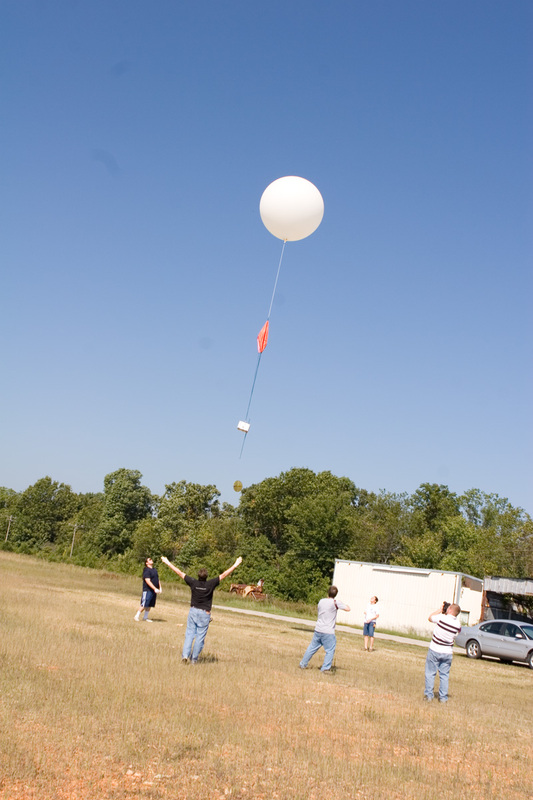 Balloon radio tracking system is complete and was tested on 9/7/2007 and again on 9/15/2007. 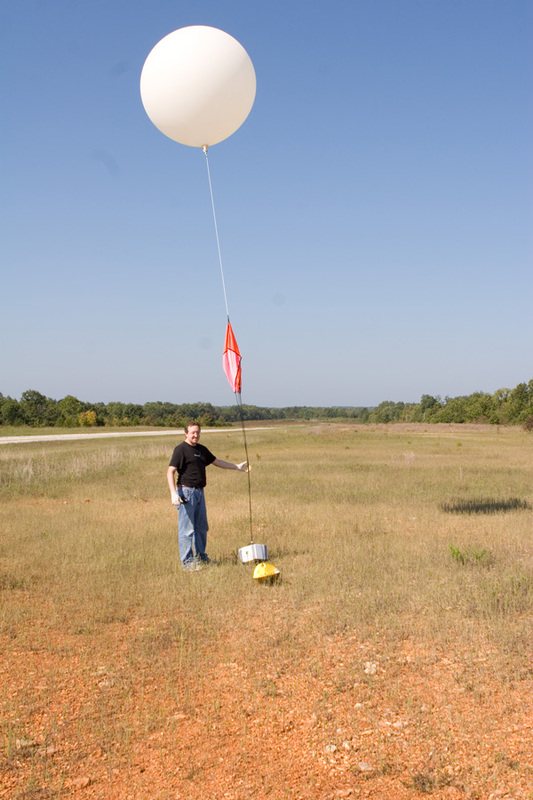 Ground tracking system is complete and was tested on 9/20/2007. Aircraft tracking system is currently not functional due to a DOA sound card in the laptop we were using. Plan is to time-share the ground tracking system. Battery runtime was tested on 9/15/2007. It was estimated that the battery was good for 7.25hrs transmitting once every thirty minutes. 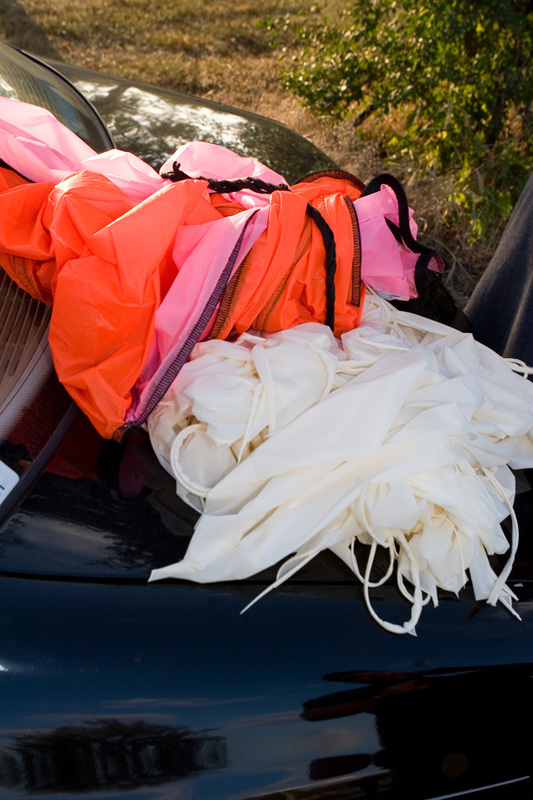 Balloons and parachutes and radar reflectors have arrived. 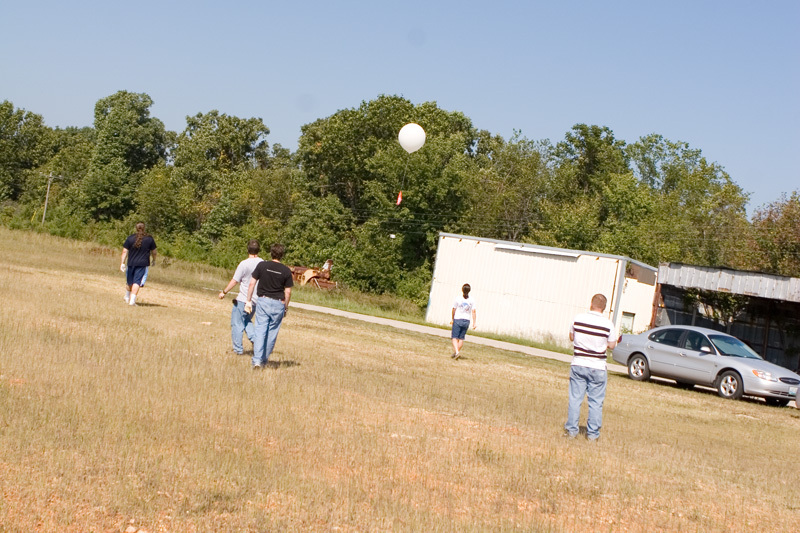 122 cu ft of Helium was purchased on 9/20/2007. This should be enough for one flight. Double Bazooka antenna has been constructed. It appears to work well and is very lightweight. Capsule harness has been fabricated. Camera was hacked to provide a set of contacts external to the camera that can be closed to trigger the shutter release. We still need to fabricate an interface between the camera and OpenTracker+. Capsule assembly is scheduled for 9/22/2007. Nathan N filed the NOTAM with FAA so aircraft in the area should be aware of our presence. Eric called the FAA and notified them of the flight. They seemed really surprised that our flight was predicted to go Northwest instead of East. We took no notice of this bad omen. We spent the afternoon and evening trying to eliminate as much weight from the capsule components as possible. A new harness was constructed, and we popped the cases off of most everything and shrink-wrapped it to electrically insulate everything. This was done as a weight-saving measure. Bryan built a totally awesome interface to allow the camera to capture an image every time the OpenTracker radio modem sends a data packet. The balloon call sign changed at the very last freaking minute to KC0VNQ-1, so we really have no idea which of the links below are going to work. I'll try to get out an update to this page after the launch. Also look for this to reek untold havoc on the tracking scripts we're running on the laptop. No one really came up with a name (and the FAA didn't ask). The Argonaut, Fatal Exception and General Protection Fault were bandied about. Since no vote was taken, I unilaterally decided to call it General Protection Fault. Godspeed, General. Jen fabricated an ingenious new lightweight payload harness which eliminated 122g from the total weight. 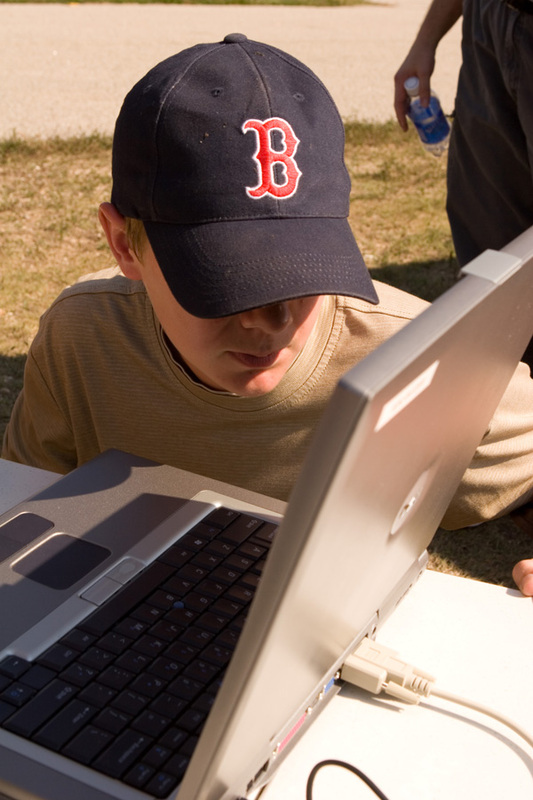 Ryan is assembling a second Windows laptop to be used as a backup tracker, and that can possibly be used in the aircraft for decoding packets. 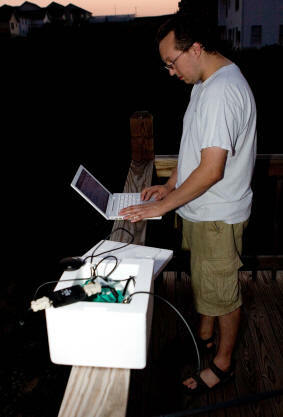 He is also writing some last-minute aircraft navigation software to make it easier for the aircraft to find the balloon. There was a discussion at one point about if the balloon is going to get tangled in the parachute cords, and whether we should attach the chute to the bottom of the capsule. Watched an awesome online video of Make magazine lose their balloon. Capsule construction is complete as of about 11pm Saturday night. Final capsule weight is about 1.5kg, and total weight including flight systems is about 3.069kg. We plan to arrive at the airport at 9am today. We never resolved the issue of who goes in which chase vehicle or when to launch the aircraft, so expect some chaos there. Jen picked up some M&Ms, and we'll be sending 36 of them (6 grams) into space along with the balloon. We'll keep a few as souvenirs and the rest will be sold as a fundraiser for the next flight. Batteries are charging. The batteries for the onboard camera and two chase cameras are charging. The main systems battery is charging. The batteries in my two cell phones are charging. The radio battery is charging. The battery we'll use to power the onsite chargers is charging. My laptop is charging. Somewhere in Rolla at least a hundred other things are being charged in preparation for the event. Took lots more photos than are shown here, but have no time to get them online. There are more pics on the How It Workss page. The launch for Sunday, 9/23/2007 is still scheduled for 10am. Contents of the capsule include 36 M&Ms. <or> Brought to you by the letters 'M' and 'B'. "Wouldn't it be funny if it went down instead of up?" No. Flight time of about 2 seconds. Altitude change of -3ft. 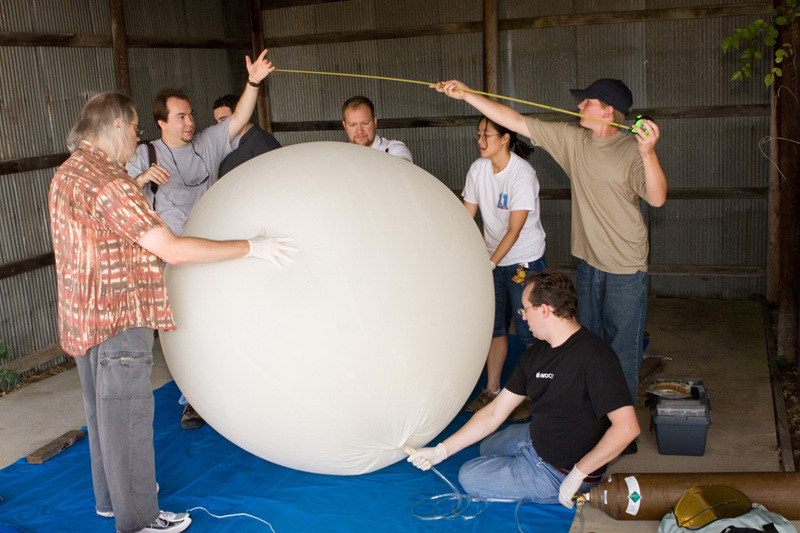 Q: "How many engineers does it take to design a high-altitude balloon?" A: "More than we had." Launch #2 - The balloon is up - Finally! "No, put *all* the Helium in! Yes - it's *seriously* that bad!" At 11:03, flight #2 rose from the Earth. And promptly crashed in to some power lines and trees. Fortunately the impact ripped the Radar reflector from the craft, allowing it to gain lift and rise out of the trees. 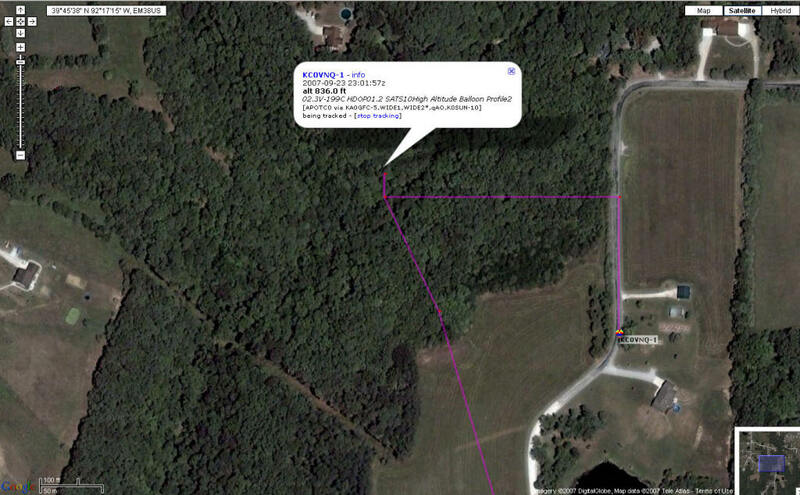 The balloon crashed into some power lines and trees shortly after "liftoff". View from the balloon - the power line can be seen in the lower left corner. "Uh oh - the RADAR reflector fell off - but it's going again!!!" 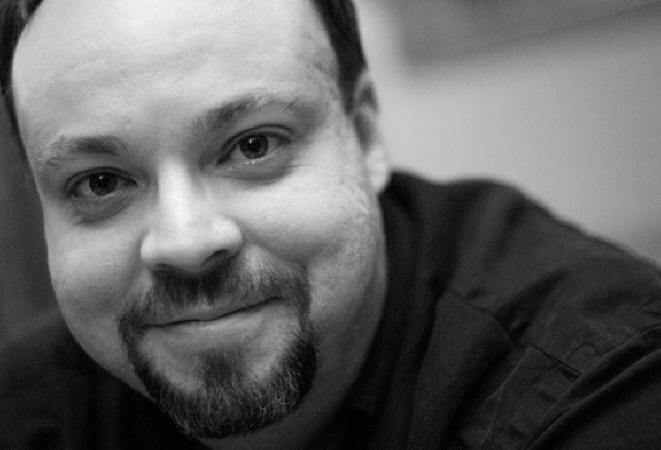 Nathan B - A Yankee. The balloon is currently at about 10,000ft altitude and about 10 miles NW of Rolla. It's going up a lot slower than we expected. Currently 380ft/min. If it goes to the full altitude, we're looking at a night time landing. 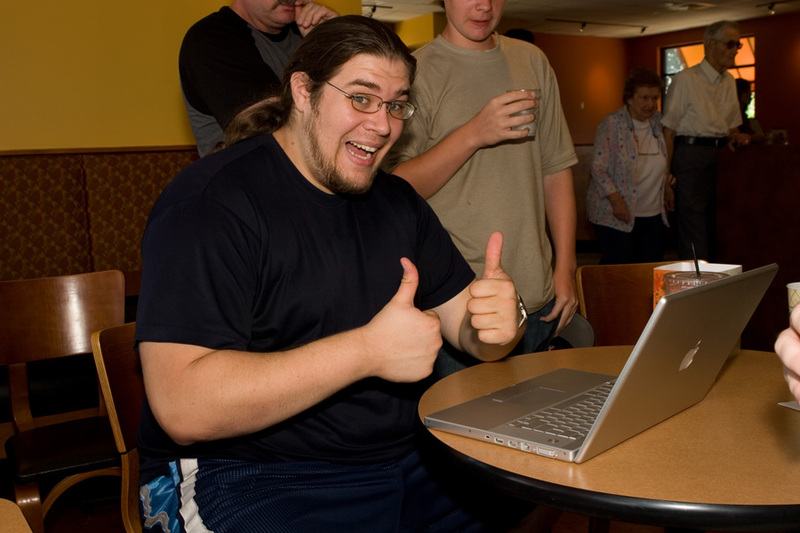 Charles Huber expresses his appreciation for the new MacBook. Ryan monitoring the payload as it moves North to Jeff City. The balloon is currently at about 52,000ft over the Holts Summit area East of Jeff City, and does appear to be following the track (at the new ascent rate) quite closely. It's about 80 minutes from earliest predicted touchdown, so we're moving the ground tracking position from Panera to Jeff City now. They thought we were crazy anyway. The aircraft will follow. Telemetry shows that the battery voltage is dropping. 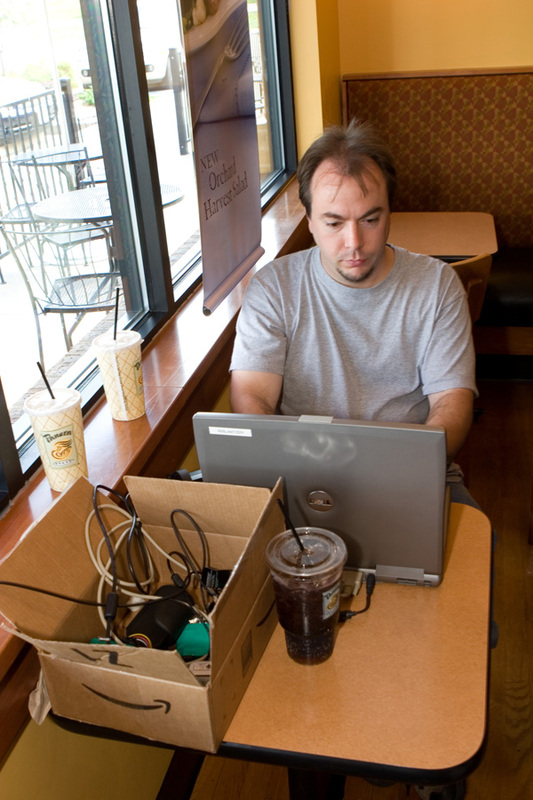 No idea how much longer we'll continue to get data packets. We arrived in Jeff City at one of Mark's radio buddies' homes and watched the internet for about 15 minutes, when the balloon popped over the Missouri River just North	of Jeff City. We appear to have reached 96,649ft at 4:09PM. 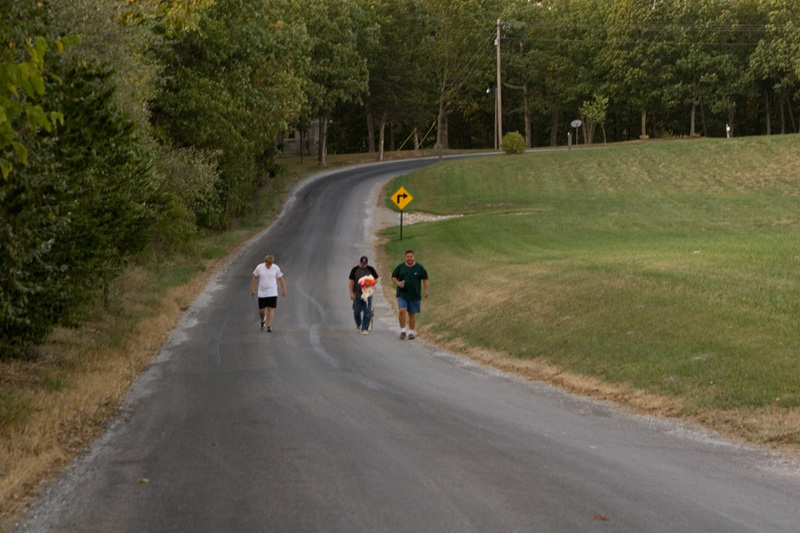 The Jeff City locals drove us out to the location and we arrived near the landing area before the capsule touched down. We still couldn't see it, so we drove North to Ashland and by that time it had landed in a location just South and West of Ashland - "Just on the edge of the woods." Total flying time was 5 hours and six minutes. The radio guys gave us some soda and beer out of a fridge in the garage. 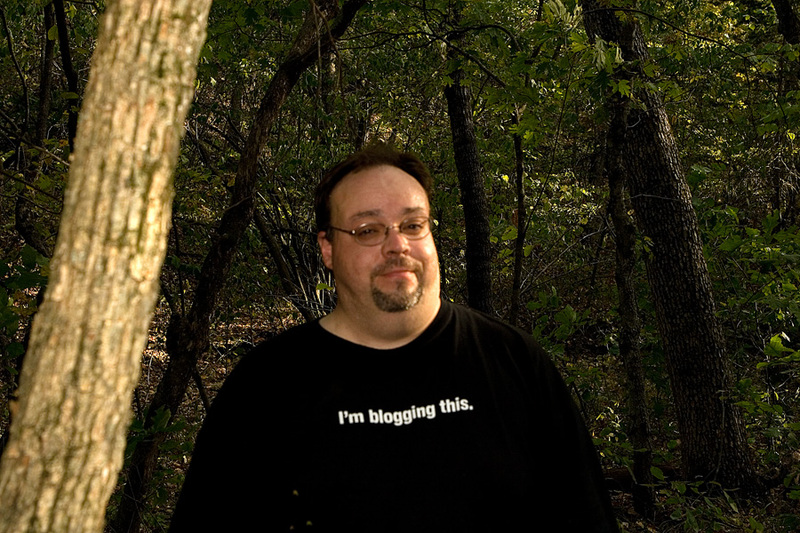 We hike across a field and into the woods. And into the woods. And down a ravine which changed quickly to more of a cliff wall of this canyon. The others chose to carefully hike down the side, and I chose to take the express route. I slipped and rolled down about 50ft, coming to rest when I hit a solid tree with my back. I cut my palm, jammed or broke my thumb, scraped up my entire left side,	scratched my chin, and I'm pretty sure I re-broke my right foot. Just then the guy who owns the property yells "There's a road right over there. Why don't you use that?" 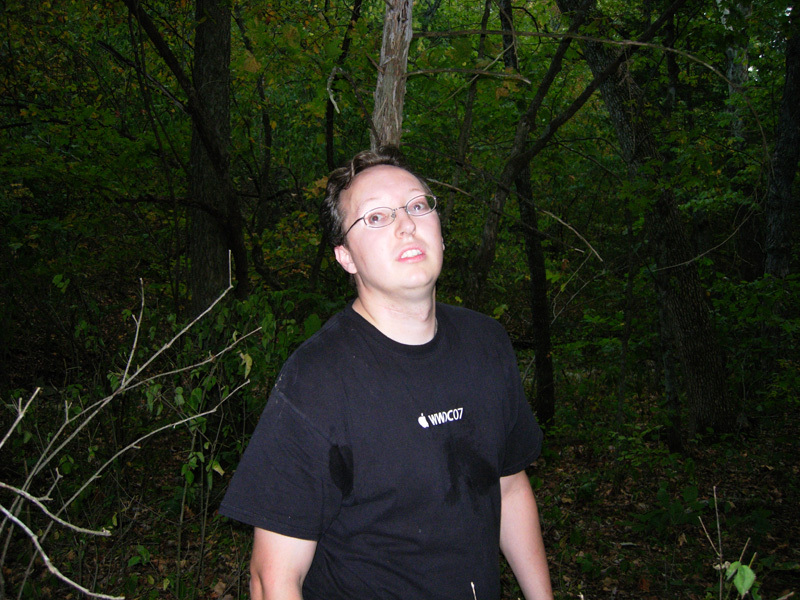 Eric - Looking all "Blair Witch". 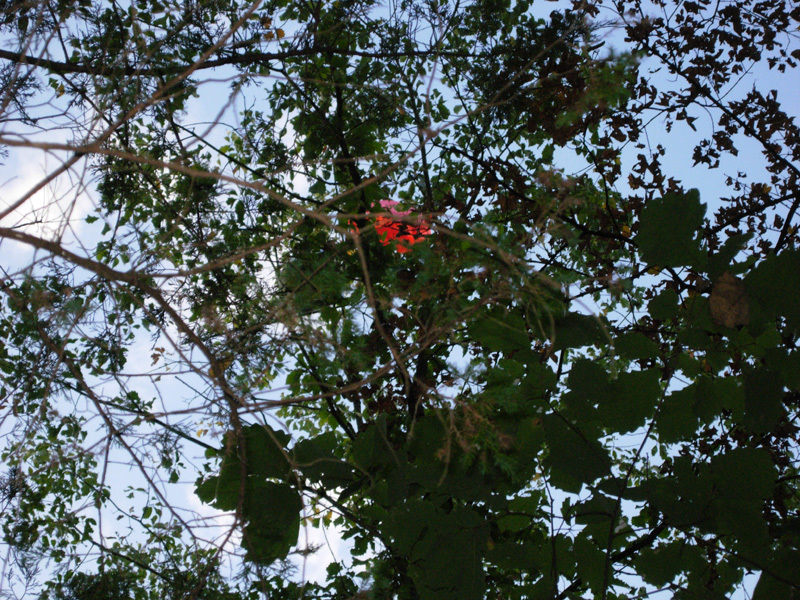 When I arrived at the bottom, I discovered that the capsule, chute and balloon remnants were at least 50ft up a tree with no branches. Ryan tried to climb it, but that didn't work out. 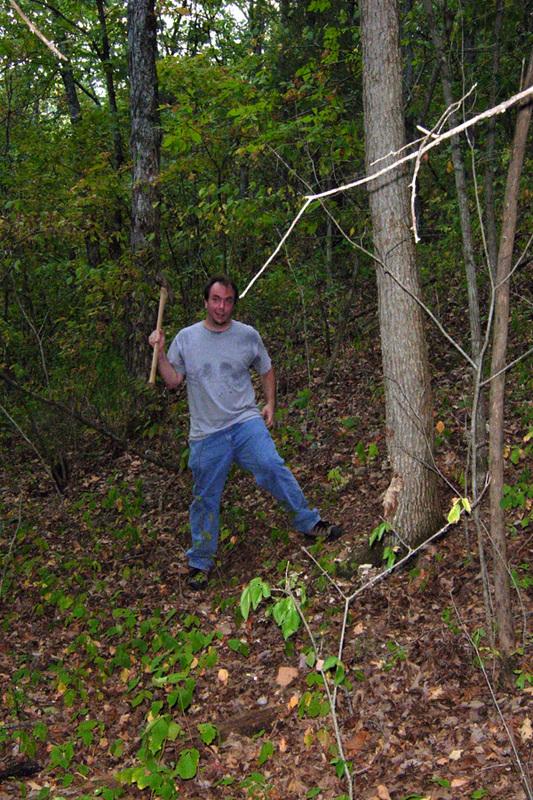 We had designs on cutting the tree down with a primitive stone ax until Mark went and borrowed a couple of axes from the landowner and get permission to cut the tree down. "Not with a 10ft Pole"
The Payload and chute were stuck up a 50ft tree. Mark - Also a Yankee. I stumbled my way back up to the top of the canyon without dying, and the owner hooked us up with some soap and water and soda and beer. Pretty much everyone we talked to on this trip had a refrigerator out in the garage full of beer and soda and waited for the others to return. About an hour later, they did, carrying first the chute and then the balloon. 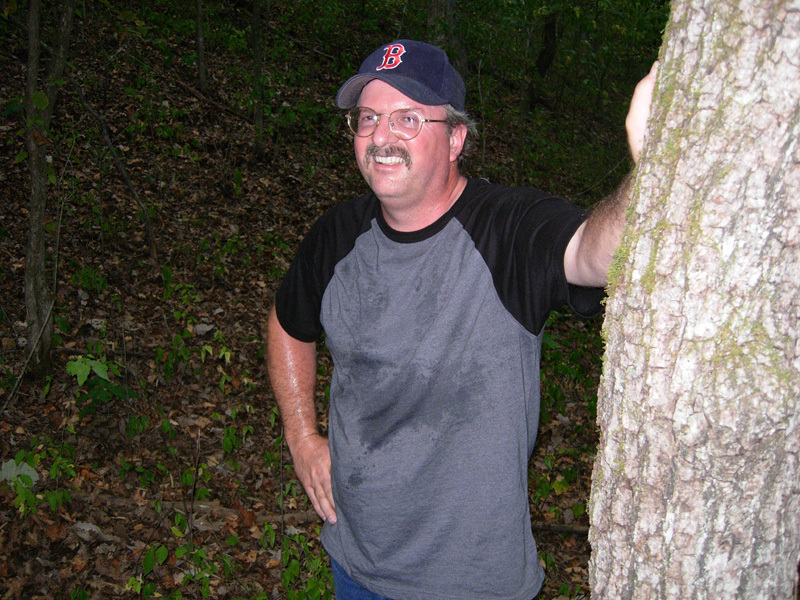 The capsule has been recovered from a wooded area near Ashland, MO. The Payload Is Recovered - Mark, the guy who owned the place and the brother in law of guy who owned the place. Launch was from the Rolla Downtown Airport at 11:03am. The Balloon burst at 96,645ft over the Missouri River just North of Jeff City. Touchdown was southwest of Ashland, MO at 4:39pm. It landed in the woods where the bubble points, and the data also shows it being carried out of the woods and to my car. A Plot of the flight. The balloon rose much more slowly during the first 30,000 foot than we thought it would, so the flight was longer than we expected by 139 minutes, and that allowed it to travel further than we predicted. The general shape of the flight path was correct, however. North northwest until 30,000ft, then circling around between 30,000 and 60,000ft, then going West until the balloon pops, then going North until touchdown. Raw Data that we received from the Internet can be seen here. Ignore the voltage and temp readings - the telemetry built into the OpenTracker+ wasn't working properly. We appear to have received 1140 data packets, not sure how many are unique yet. We continued to receive perfect transmissions from the balloon throughout the flight - the antenna and tracking systems couldn't have worked better. It was still transmitting when the tree was felled and the antenna broke. It was still transmitting when we removed the battery power at the car. The balloon was twisted around the parachute as we predicted. The Styrofoam peanuts were lots smaller than they were when they went up. I would probably use an open-cell foam rubber next time as a capsule space filler. The M&Ms were fine, but they were all slightly cracked on the candy coating. Everything inside the capsule was very warm when we opened it. The camera didn't fire for the whole flight. It stopped around 2:35pm after 311 images, at least one of which included the power line and people on the ground running frantically toward the train wreck. A larger battery is needed for the camera. We should have carried retrieval materials (axe/pole/whatever) in the chase car. We should have carried hiking boots, bug spray and a first aid kit in the car. 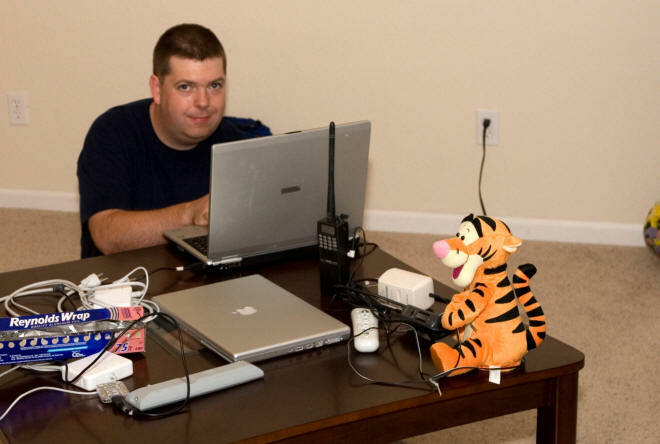 Nathan Neulinger has provided the use of his aircraft during testing and final tracking, and he wrote some software to allow him to navigate the aircraft to the last received position of the balloon. 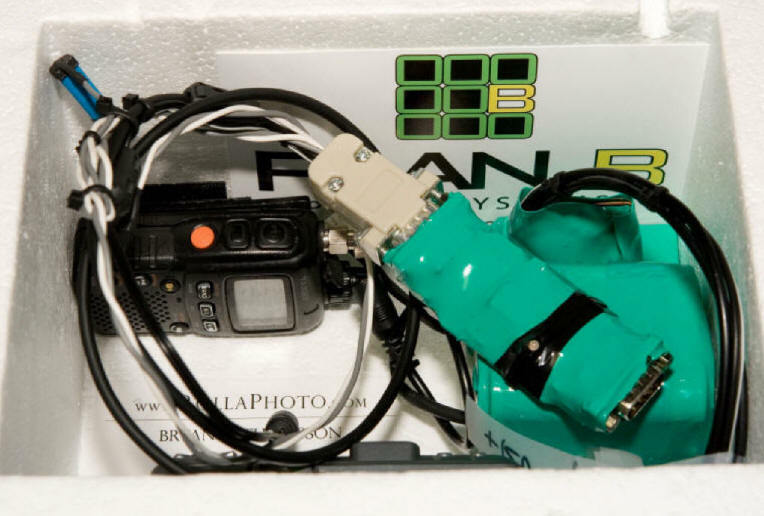 Bryan A. Thompson and RollaPhoto.com have provided GPS, OpenTracker radio modems on the ground and in the air. 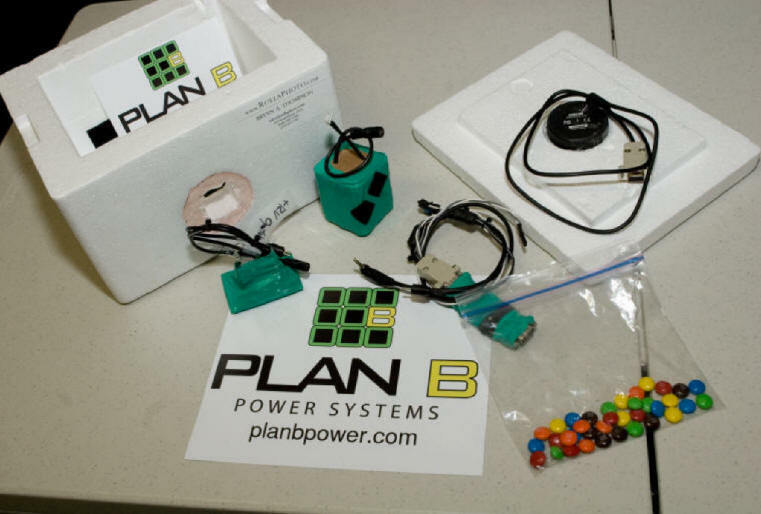 Bryan designed and build the tracking system, including the custom battery, voltage regulator board, and about 100 custom cables required to connect all of this stuff! 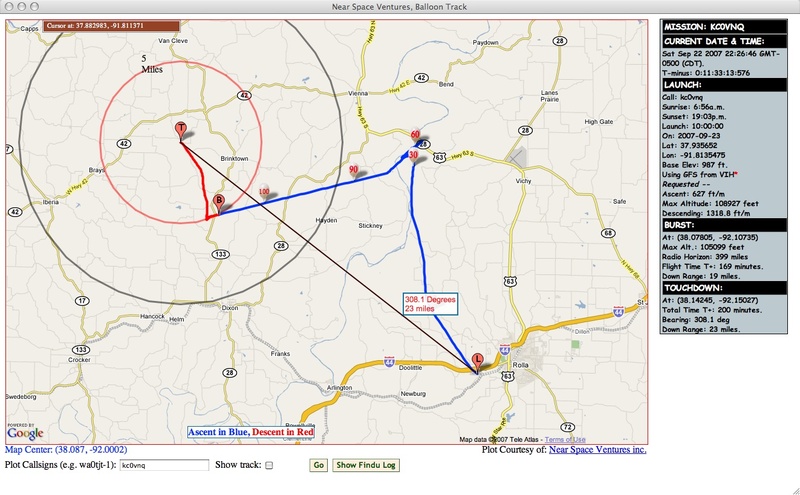 Ryan Lantzer has written some awesome Perl tracking scripts we’re using on the ground tracker. They communicate with GPS and radio modem and dynamically generate a KML file that is plotted in Google Earth. He also assisted with the assembly and testing of the GPS and interconnect cables. Mark and Nathan Bookout have provided the communications systems and services that we’re using, including the ground and air radios and antennas used by them. They've also been responsible for rallying support of the local amateur radio operators, which has helped us tremendously. 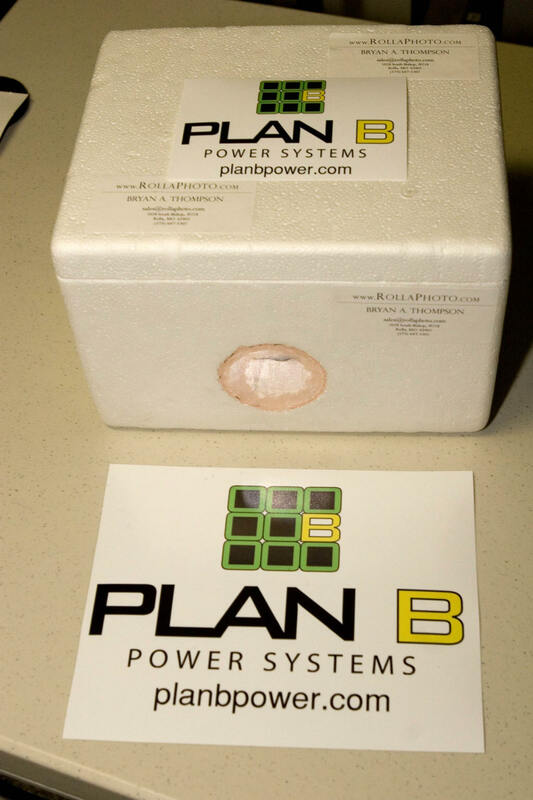 Our friends at Plan B Power Systems (PlanBPower.com) has provided the ground and air batteries, chargers, voltage regulators and power inverters used for the mission.